If you are a candidate for the TE School Board or the Tredyffrin Township Board of Supervisors, Tuesday, March 10 marked the last day to circulate and file nomination petitions at Chester County Voter Services for Pennsylvania’s May 19, 2015 Primary Election. TE School Board candidates must file a petition signed by at least 10 qualified voters of the school district for the political party with which the petition will be filed. Generally, school board candidates cross-file. To cross-file in a primary election (that is, to run on both parties), a registered Democrat or Republican must circulate a proper petition for the other party. The petition must contain signatures as previously mentioned. If elected on both party ballots in the May primary, a candidate will appear on both party ballots in the general election in November. Between the Tredyffrin Township Board of Supervisors and the TE School Board, there are a total of nine seats available and of those nine seats there are only two incumbents seeking reelection. In addition, the current Tredyffrin Township Auditor Bryan Humbarger (R) is not seeking reelection. The candidates for Tredyffrin Township Auditor are Mary McCracken (D) and Lynn Shine (R). In a review of the slate of supervisor candidates, there are some familiar names and some not so familiar names among the list. The District 1 East supervisor race has a re-match between Tredyffrin Township Planning Commissioner Chair Tory Snyder (D) and long-serving Republican supervisor Paul Olson, president of ANA Laboratories, Inc. If you recall in 2011, this particular Tredyffrin supervisor race was extremely close with Olson (R) receiving 1,331 votes and Snyder (D) receiving 1,318 votes. Only 13 votes separated the two candidates four years ago, it will be interesting to see what happens in 2015. Besides Snyder, there are two other Tredyffrin Township Planning Commissioners seeking elected office – At-Large supervisor candidate Trip Lukens (R) and TE School Board candidate Ed Sweeney (R). Lukens, a principal at Lukens & Wolf, a real estate appraisal and consulting company ran with current Chester County Commissioner Michele Kichline (R) as at-large supervisor candidates two years ago but lost the election to Democrats Mark Freed and Murph Wysocki. Another interesting twist in the 2015 supervisor candidate race is at-large candidate Sean Moir (R). Owner of Western Heritage Mapping, a historical mapping service, Moir isn’t new to the local campaign circuit. Moir previously ran as a Tredyffrin at-large supervisor candidate six years ago but as a Democratic candidate. I was on the Democratic ballot as an at-large supervisor candidate with Sean but following our defeat in 2009, I changed my political party status back to Independent whereas Sean’s path took him to the Republican Party. New names to the Tredyffrin Board of Supervisor races includes candidates Heather Greenberg (R), Elva Bankins (D), Lou Horvath (D) and Yolanda Van de Krol (D). A quick Google search indicates that Greenberg is a CPA working as Director of Finance and Administration at ModSolar; Bankins is management consultant and leadership development coach and speaker; Horvath is Director of graduate online health services at St. Joseph’s University and Van de Krol is Vice President, Relationship Manager at Customers Bank. Looking at the TE School Board, there are five open seats available this election cycle – two for Tredyffrin Region 1, two for Tredyffrin Region 2 and one for Easttown Region 3. In addition to the Region 1 and Region 2 seats in Tredyffrin Township, Region 3 in Easttown Township has one seat available. Currently serving school board director Dr. Pete Motel (R) is not seeking reelection. Republican candidate for Region 3 is Kate Murphy and the Democratic candidate is Francis Reardon, owner of a local construction company. Democrats on the ballot for Tredyffrin East Region 1 are Dr. Roberta Hotinski, a geoscientist at Princeton Environmental Institute and environmental attorney Todd Kanatorczyk, a partner at Manko, Gold, Katcher & Fox. Republicans opposing Hotinski and Kanatorscyk in Tredyffrin East Region 1 are Neal Colligan, a commercial mortgage banker at CKPP & Associates and Dr. George Anderson, Director of International Student Development at Valley Forge Military Academy. I am pleased that my friend Neal Colligan, a mainstay at regular school board meetings and finance committee meetings, is a candidate for the school board. A longstanding supporter of the District’s aides and paras, he has continually offered background and expertise on the District’s finances. Currently serving as TE School Board President, Republican Kris Graham is seeking reelection to another term. Attorney with Wusinich & Brogan and current Tredyffrin Township Planning Commissioner Ed Sweeney (R) is running with Graham for Tredyffrin West Region 2. Opposing Graham and Sweeney are Democrats Michele Burger and Alan Yockey. You may recall, Michele Burger was front and center on the Valley Forge tennis court issue, helping to save them from demolition by the school district. Joining Berger for Region 2 is Alan Yockey, a retired IT consultant. Here’s hoping that the focus of the local 2015 political campaign season is about the issues and the candidates that best represent the vision of the community. It’s important to know the person that you are voting for and whether or not the candidate best represents your views. It’s your school district and your township – make your vote count! Thank you to all of the candidates for stepping up to run for office! We learned at last night’s school board meeting, that the TE School Board’s way around the Affordable Care Act compliance issue is to reduce employee hours. The ACA does not require the District to provide health insurance to those employees working less than 30 hours a week – so the District’s answer to the Federal law is simple … cut hours of the lowest paid employees. 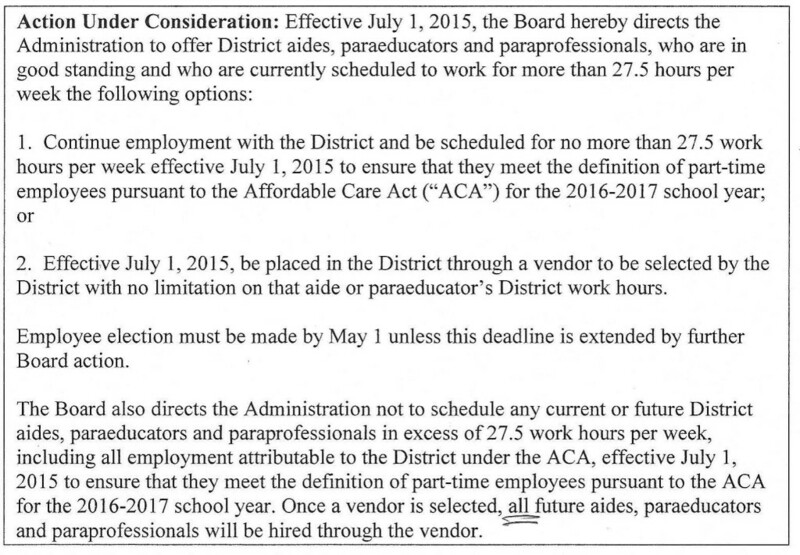 The District’s quick and dirty solution to avoid ACA compliance issues for 73 full-time District aides and paraeducators is to give them two options – either the full-time employee agrees to work part-time (27 ½ hrs. or less) or they will see their District job outsourced, effective July 1. The Board vote to approve the resolution was 7 – 1. Republicans Kris Graham, Jim Bruce, Virginia Lastner, Doug Carlson, Peter Motel and Democrats Karen Cruickshank and Kevin Buraks voted in favor of the resolution. Democrat Scott Dorsey opposed the resolution and Republican Liz Mercogliano was recused from voting because her daughter is a part-time aide in the District. In addition to not voting, Mercogliano was not permitted to comment or ask any questions regarding the Affordable Care Act. Voting is one thing but it is unclear why District solicitor Ken Roos would not permit Mercogliano to ask questions regarding the Affordable Care Act. The full-time District aides and paras did not receive notice that last night’s school board meeting would include a decision regarding their employment future. Nor was there any attempt to seek public comment or discussion on the ACA compliance issue. Buried on page 4 of the meeting agenda was the seemingly innocuous ‘ACA Update’. Other than school board directors and some administrators who would know that ‘ACA Update’ was actually code for outsource the District’s aides and paraeducators. To be clear, the resolution did not appear in the online agenda materials or on the District website (it was only available to those attending the meeting). The 73 full-time District aides and paraeducators learned their fate following the Board meeting, through a 10:30 PM email from Personnel Director Jeanne Pocalyko. The aides and the paras must make a decision by May 1 – they can opt to stay a District employee as a part-timer (with reduced hours) or their job is outsourced to an unnamed vendor. No details about the selection process of a vendor – will the District solicit vendors through an RFP or has the unnamed vendor actually already been decided? A key component in the computation of PSERS (retirement benefits) is the final average salary of the employee, which is calculated based on an average of earnings during their last three years of employment. So … say one of these full-time District aides was 57 yrs. old and had planned to retire at age 60. Under the conditions of continued District employment, he or she has a substantial reduction in salary from full-time to part-time status. Because the PSERS calculation of retirement benefits is based on these final three years of employment – with earnings reduced by the District, the employee will see their retirement benefits reduced at time of retirement as a result. Are there legalities with this resolution – the Board’s decision will affect the future retirement benefits of 73 District employees. Many of the District aides and paras have served the District’s children and their families for years; is this the way the Board rewards their loyalty? Ms. Graham’s term on the school board ends in 2015 but she plans to seek reelection. Will her leadership in the outsourcing of aides and paras influence her endorsement by the Tredyffrin Township Republican Committee? More importantly, will Graham’s decision to outsource influence voters in November. The terms of Jim Bruce, Liz Mercogliano and Pete Motel also end in 2015. I know that Bruce will not seek re-election but not certain of the plans of Motel and Mercogliano. The key is that typically the highest paid three years would occur at the end of one’s career. In the case of the TESD aides and the paraeducators who will go from full-time to part-time hours should they choose to stay employed in the District, their pension will be based on a prior 3-year period. Go Green . . . Backyard Eco-Tour in Tredyffrin Tomorrow! Based on the overwhelming success of last year’s garden tour, eco-gardener extraordinaire Cheryl Bittner has organized and chairs tomorrow’s backyard eco-tour in Tredyffrin. Featuring eight eco-gardeners in our community, the public is welcome into their backyards on Saturday, July 16. The Tredyffrin Backyard Eco-Tour will offer an opportunity to see how some residents are gardening in an environmentally friendly way. Living in a sustainable community nowadays is becoming more important as our water and non-renewable resources are becoming scarcer. 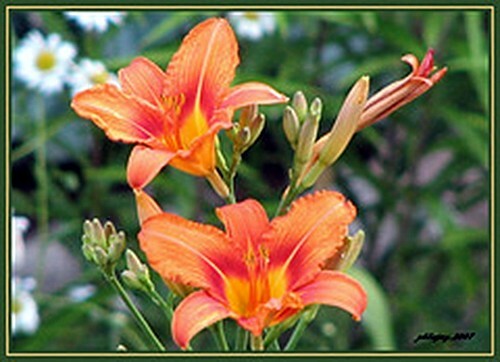 Eco-gardens prove that you can have a landscape that is beautiful and unique – and gentle on the environment. The tour will provide visitors with plenty of inspiring ideas for their own gardens. The cost to tour the backyards of this year’s selected eco-gardeners is $10 per adult, with children under 18 free. The tour is 10 AM – 4 PM and you can purchase your ‘badge’ and pick-up maps and directions starting at 9:45 AM at the Tredyffrin Township Library parking lot, 582 Upper Gulph Rd, Strafford/Wayne. The eco-tour is self-guided . . . go where you want for as long as you want. Sponsored by the Tredyffrin Township Democratic Committee, the eco-tour is non-political event and everyone is welcome. Billed as a ‘rain or shine’ event, tomorrow’s forecast is for a beautiful summer day . . . perfect for a garden tour! Once a State Rep Campaign Debate, Could the Tolling of Rt. 422 be a ‘Model’ for Tolling Highways across the State? What’s the saying, ‘What Goes Around, Comes Around” . . . ? For most of the year 2010, voters of Tredyffrin Township had a front row seat as the ‘tolling of Rt. 422’ issue became a political football in the PA State House 157 race between incumbent State Rep Paul Drucker (D) and challenger Warren Kampf (R). Some political insiders might even argue that Drucker’s stance on 422 tolling may have contributed to the loss of his state representative position last November. Although a heated campaign issue, post-election the tolling of Rt. 422 has had nearly non-existent discussion. That is until now. According to Pennsylvania Independent, an on-line news service, the 25-mile, four-lane US Route 422 will be promoted on Monday, June 6 as a potential ‘model’ for tolling highways across the state as a means to increase transportation funding. Gov. Corbett’s recently appointed 30-member Transportation Funding Commission will hear a presentation on how tolls would work on Rt. 422 in Montgomery, Chester and Berks counties. The executive commission is looking at a way to generate at least $2.5 billion in annual transportation funding for infrastructure needs and the ‘tolling of 422’ may serve as the state’s model for how to do it. According to Barry Schoch, Secretary of Transportation for Pennsylvania and chairman of the commission, “Route 422 model would allow county or municipal authorities to form a ‘local taxation authority’ and keep the revenue from tolls and local taxes dedicated for local highways”. Construction of a local suburban commuter rail line was one of the possible uses of 422 tolls and a means to alleviate some of the highway traffic. If you recall, the Philadelphia-based Delaware Valley Regional Planning Commission (DVRPC) created a Route 422 Corridor Master Plan and presented their findings in 2010 to local municipalities, including Tredyffrin Township. Their plan, among other things, provided for a light rail commuter service and suggested tolling on Rt. 422 as a way of financing the project. During 2010, the tolling of 422 provided a major talking point for the Drucker and Kampf political campaigns. Drucker supported DVRPC and the Route 422 Corridor Master Plan, which included tolling of 422. However, Drucker was specific that the tolling was for the commuter who was traveling the entire stretch of the highway on a regular basis, not the occasional user or those that would use it on-off. In response to Drucker, Kampf’s opposing position on the Route 422 Corridor Master Plan was simple. On his campaign website, Kampf stated “My position on tolling Route 422 is clear: I oppose it.” Remaining true to his campaign words, when asked to respond to the upcoming Transportation Funding Commission presentation to use tolling of 422 as a model for the state, Kampf said, “Tolling is another way of taxing people. . .” He is opposed to using state and local funds to build, operate and maintain a commuter rail line that would benefit rail commuters at the expense of others. Like much of the country, many of Pennsylvania’s roads and bridges are in crisis; desperately in need of repairs. Although lawmakers on both sides of the aisle agree on the infrastructure needs, they may not be as unified in the funding solutions. No one has a crystal ball, but we now see evidence from Corbett’s Transportation Funding Commission that supports Drucker’s vision for the future . . . a suburban commuter rail line and the use of tolls to finance infrastructure improvements. Some could argue that State Rep Kampf battled former State Rep Drucker successfully on the 422 tolling issue, but it looks like Kampf could face a far greater challenge in Harrisburg . . . and, from both sides. Dariel Jamieson, chair of the Tredyffrin Township Democratic Committee, provided a comment to Community Matters. Jamieson’s remarks speak directly to the hand count by Chester County Department of Voter Services on Monday of the Special Election ballots. Her remarks provide us with further details of the recounting process and I thought it important to provide them in this post (see below). In her remarks, Jamieson brings up an interesting point – it certainly would have helped if Voter Services had run the ballots through a voting machine prior to the hand count. I would think that if Voter Services could duplicate the machine malfunction error, there would be a greater probability of correcting the problem! Echoing a question that another CM reader posed, what were the candidates told by Voter Services as the ‘reason’ for the 61 uncounted votes. In reading between-the-lines of Jamieson’s remarks, is there a sense that the end of the story may not yet be told? I have been told by our witnesses that there was NOT a machine count of the Tredyffrin votes prior to the full manual recount. We believe Voter Services acted with good intentions, thinking it would be helpful to speed resolution of the special election by going right to a manual count. While this did speed things up, I personally believe that a machine count first might have shed some light on how and why the machines might have been malfunctioning. Voter Services also told our witnesses that there was no way to know for sure that all the uncounted ballots were Republican, although seeing the outcome of counting them Makes it look like they were. We were told that all the ballots that were accepted into the machines end up in the same compartment, so it could not definitively be said which ones were counted and which were not. If something was wrong with only Republican ballots, why did they not all reject? A reconciliation of the number of ballots that were counted in the manual count has not yet been reconciled to the number of signatures in the sign in sheets and names in the poll books. Voter Services has said that those kinds of reconciliations will be done after all the precincts in the County have gone through the official count process. If those numbers all match, then one could conclude that the number of physical ballots that were manually counted was the correct number of ballots. If they should not match, one would have to ask where the additional ballots came from. Speculation that putting the ballots in face up, face down, backward, or with poor tears of the perforation could all be possible, but that seems incompatible with the idea that all the unread ballots were Republican. And adding 61 ballots to the mix will almost certainly change the totals in the other races, bur probably not enough to change any primary election vote outcomes. We, too, are waiting for answers. Late last night I received a press release from Mike Heaberg (see below) that declares his victory in the Special Election. Both political parties appear to be satisfied with the special election ballot hand counting on Monday by Chester County Department of Voter Services. The recounting process uncovered 61 ballots that were not originally counted, adding 52 additional votes to Republican Mike Heaberg and 9 additional votes to Democratic Molly Duffy totals. The original vote count had favored Duffy by 40 votes, but with the additional votes, the final vote count was Duffy, 2,275 votes and Heaberg, 2,278; a difference of only 3 votes, in favor of Heaberg. We now know that all 61 ballots belonged to registered Republican voters, leading to many questions. It is understood that the actual ballots of the Republican, Democratic and Independent voters are printed differently. The only thing that makes any sense is that there appears the problem may have been a printing or alignment issues on the Republican voter’s ballots. I have also learned that the problem was not at only 12 of the 17 precincts as I previously wrote, but actually occurred at virtually every precinct. Therefore, if we assume that there were mechanical issues with Republican ballots, printing or otherwise, I still find myself struggling with several issues and maybe someone can help me. After the polls closed on election day, I assume that there is a certain procedure that takes place, i.e. tallying the votes, posting the results at the precincts, delivery of materials to Voter Services, etc. As part of this procedure, each precinct must have an individual responsible for ‘signing-off’ on the accuracy of the vote count, correct? So did these individuals sign-off on the results? Did they report the inaccuracies to Voter Services when they delivered the materials that evening? I am curious how the actual procedure works — maybe Steve Shapiro as Judge of Elections for W-2 precinct could help us understand the procedure. I understand that Voter Services was aware made aware of various issues, including malfunctioning machines, during the course of Election Day. If Voter Services knew there were problems and that the vote count was inaccurate, why would they bother to post the precinct vote count and the final totals on their website? Would it not be more appropriate for them to make a statement concerning the problem and that they were working to correct the discrepancies? The issues surrounding the special election – the malfunctioning voting machines, the uncounted 61 votes, inaccurate reporting of ballot results, etc. are unsettling and troubling; and I look to Voter Services for answers and accountability. Not only about what exactly went wrong but also how they intend to correct these problems in advance of the general election in November. At a minimum, I suggest an internal examination of Voter Service procedures. Should the County Commissioners investigate? The closeness of the election results, coupled with reports of voting machine malfunctions, has led to speculation about a possible vote recount in the Duffy-Heaberg special election. As reported on the Chester County’s Department of Voter Services website, the unofficial election results indicate that Democrat Molly Duffy received 2,266 votes and Republican Mike Heaberg received 2,226 votes. I have received several notices stating that the Republicans were challenging the election results of the special election and calling for a vote recount so . . . I did some investigating in hopes of better understanding the process. First off, I called the Chester County Department of Voter Services. As of 3:30 PM today, Thursday, there has been no ballot challenge petition received for the special election or any other race in Tredyffrin Township. Further, as was explained to me by a voter service staffer, it would be unlikely that such a petition would be received at this point in the election certification process. Why? Here’s what I learned from a Chester County’s voter service staff member on the certification process. The voter service ‘computation committee’ will meet for the first time tomorrow (Friday) to begin work on the 2011 Primary Election certification process. This committee will take 2-3 days to sort through all the paperwork from the 226 voting precincts in the county (Tredyffrin Township has 17 voting precincts). After sorting the paperwork, the committee begins with write-ins, absentee votes and reconciliation of ballots from each precinct in the county. To complete the certification process will take the computation committee 4-6 weeks. According to the voter services representative, it would be unlikely that someone would challenge the vote count until the certification process is completed. It would appear that a candidate should wait until the election results are certified and pronounced official. I asked if the reported malfunction voting machines would pose an additional time delay and the response was not likely. Curious, I asked if there was such a thing as an ‘automatic’ recount of votes if the certification process indicated that a race was very close, say just a few votes separating the candidates. The answer was no; there is no automatic recount; regardless of how close the election results. Next question, how much does it cost to petition for an election recount? I discovered that Chester County Department of Voter Services does not handle the money side of a ballot challenge and I was referred to the Chester County Prothonotary’s Office. I called the Prothonotary’s Office and spoke to Elizabeth Doan, First Deputy. Deputy Doan explained that the fee schedule for a ballot challenge is $153.80 per precinct. Since the Duffy-Heaberg special election was for an at-large township seat, the petition charge is $153.80 for each of Tredyffrin’s 17 precincts or a total cost of $2,614.60. Additionally, there is a bond fee of $50, which the applicant would need to petition to have returned. It was unclear if the $50 bond fee was per precinct or a one-time fee; Doan suggested that I contact an attorney for clarification. What did I learn from this exercise? It would not appear to make sense to petition for a ballot challenge until after Chester County Department of Voter Services completes its certification process. The computation committee has to first complete their certifying process before they can do a recount and that would be 4-6 weeks from this point. I was cautioned throughout my conversation with voter service staff that the election result numbers on county website are unofficial until they are certified. I hope that this clarifies the ballot challenge process and offers a timeline for the election results certification and the cost of a petition process in Chester County. Light at the End of the Tunnel for Tredyffrin’s Special Election Candidates – Your Vote Counts! There is light at the end of the tunnel for Republican Mike Heaberg and Democrat Molly Duffy, Tredyffrin’s special election supervisor candidates. Monday, May 16 will be the last full campaign day before the special election and primary election the following day. Appointed interim township supervisor on February 7, Heaberg faces opposition from Duffy in the special election . . . they will take their case to the voters on Tuesday, May 17. Vying to fill the open Board of Supervisors seat left vacant by State Rep Warren Kampf, Heaberg and Duffy have spent much time at people’s doors in the community, asking for support and hoping to garner a commitment of a vote. Historically local voter turnout for the primary election is dismal; but maybe the prospect of choosing a supervisor in the special election will attract more voters this year. For us registered Independents, primary elections come and go in Pennsylvania, always without us . . . sadly we do not get to vote in primaries. Pennsylvania is one of 18 states where Independent voters cannot vote in primary elections; I have often-thought that closed primaries disenfranchise a significant number of the American people. So although we must leave it to our Republican and Democratic friends to vote in Tuesday’s primary election, the Independents can make our voice heard in the supervisor selection process in the special election. Yes, all registered Independent voters, your vote will count in the Heaberg-Duffy special election race. Although we only get one vote on Tuesday, it is an important vote nonetheless . . . your can help decide who will serve our community as an at-large supervisor until January 2012. Regardless of who merges victorious on Tuesday, Heaberg and Duffy will both appear on the November general election ballot for a full 4-year term. For registered Democratic and Republican voters, you too can vote in the special election but, additionally you can vote in the primary election for supervisor, school board and magisterial district court judge candidates. 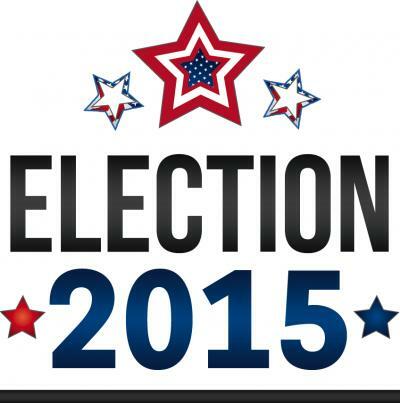 The polls will be open for the special and primary election from 7 AM – 8 PM. Below are all our local candidates that will appear on Tuesday’s ballot. In case you missed them the last time I posted them, I have again included each candidate’s resumes or bios. (click on the candidates names). Although I encourage and welcome thoughtful debate and commentary on Community Matters, it is your vote that will make the difference on Tuesday! It is my understanding that all school board candidates have cross-filed as both Republican and Democratic candidates. Jeremy Blackburn (R) ** No resume provided by candidate.